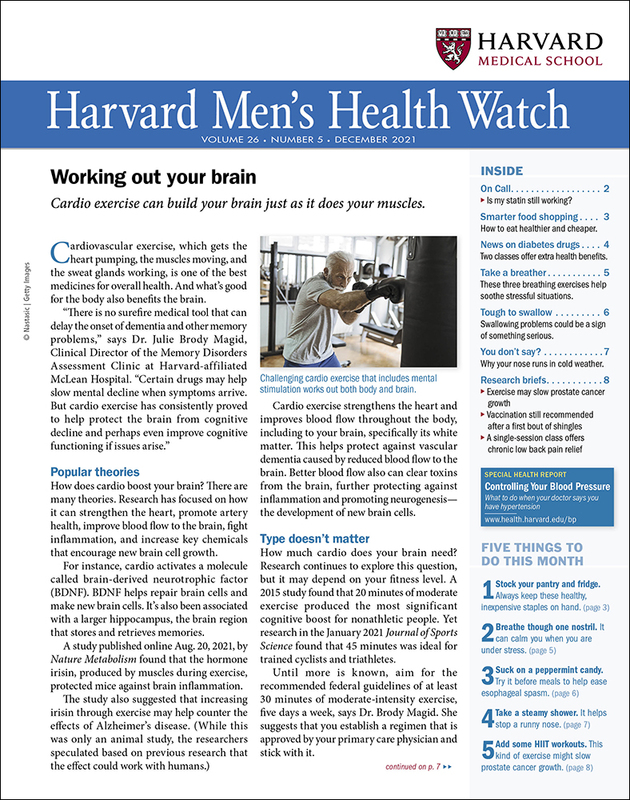 Reading Harvard Men’s Health Watch each month is the simplest, easiest thing you can do to improve your health. In today’s fast-paced, information-packed world, it’s not always easy to do the right thing for yourself. But a few minutes each month with Harvard’s physicians in the pages of Men’s Health Watch can help you reduce your stress, lower your blood pressure, reduce your cancer risk, ease your joint pain, and live a healthier life. Let the doctors and researchers at the Harvard Medical School show you the way to a longer, healthier, happier life in the pages of Harvard Men’s Health Watch. Easy-to-read, clear, and concise, Men’s Health Watch is full of actionable advice you can incorporate immediately into your daily routine. I've subscribed for several years. By far, the best, most timely, and well supported information I've come across. My only complaint is the lack of a search function to find articles in back issues. I'v recently switched my Harvard Mens Health Watch from written form to E form. Its great & easy to use. I can view each section & print any section I want in my permanent records. I like the way each section has a print function at it's end for convenience. Thanks. I appreciate the on-line availability of back issues. I have a mixed stack of five health letters going back for years and it takes a lot of work to find any specific article. Now, adding a Search function to the on-line back issues would be a tremendous improvement. I would like to see more info on the emotional effect of aging and how others are dealing with the changes and losses of the process. From the editors of the Harvard Men's Health Watch. The following are links to online information mentioned in past issues of Harvard Men's Health Watch or to extra information we couldn't fit into the printed version.